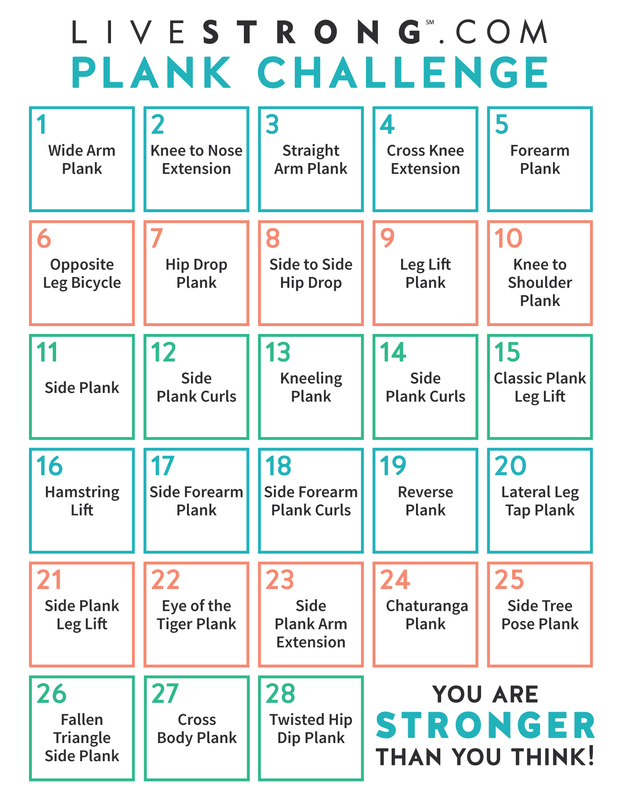 During week 3 of the LIVESTRONG.COM Plank Challenge, we're ditching sit-ups and crunches to give you seven toning plank variations that'll work more muscle groups and burn more calories. By this point in the challenge, you should be challenging yourself to hold each variation for at least a minute. HOW TO DO IT: Start in a full plank (like the top of a push-up), and then lift your foot a few inches off the floor for five seconds. Then set that foot down and pick up the other foot. Hold that foot for five seconds. Keep alternating for the full minute. HOW TO DO IT: Begin at the top of a push-up position. Bend one leg at the knee and pulse the foot up to the ceiling 10 times. Lower that leg and repeat on the other side for another 10 lifts. Alternate legs for the full minute. HOW TO DO IT: Roll over to one side, and then prop yourself up on your forearm. Raise your other arm up overhead. If you need to modify, bend the top leg and place that foot a bit in front of you for added support. Hold for 30 seconds, and then switch sides. HOW TO DO IT: Start in a forearm side plank, and with your hand behind your head, twist so that your top elbow reaches down toward your bottom arm. Keep twisting for 30 seconds before you switch sides. HOW TO DO IT: Sit with your legs extended in front of you. Place your hands a bit behind you, and then lift your body off the floor so that you're in a flipped-over plank position. Hold for one minute. HOW TO DO IT: Begin in the top of a push-up position. Take one foot and tap it out to the side three times. But with each tap, extended your leg out further. Repeat on the other side for three taps, and then keep switching legs for the full minute. HOW DO TO IT: Start in a forearm side plank, and then lift your top leg several inches off the floor. Now hold! If you need to modify, bend the top leg and place that foot a bit in front of you for added support. Hold for 30 seconds, and then switch sides. Look out for the final, and toughest, set of the 4-Week Plank Challenge coming up next week in week 4. Keep track of your progress with this print-out calendar. Don't forget to join our Facebook Challenge Group to get support, motivation and virtual workout buddies. Also, be sure to follow Elise on Facebook and Instagram. Love her outfits? Get her Week 3 look at Outdoor Voices, lululemon, Spiritual Gangster and Splits 59.